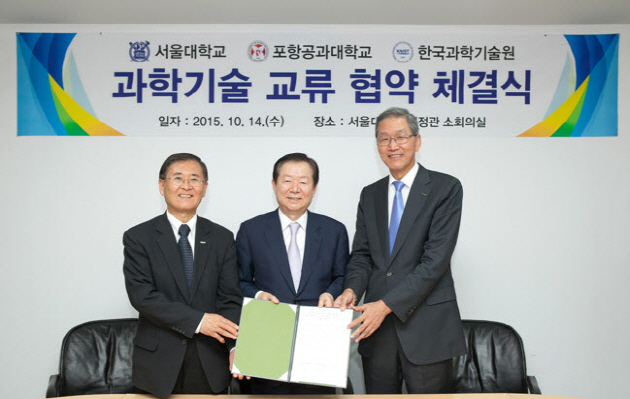 On the 14th of October, Korea’s foremost science and engineering universities, Seoul National University (SNU), Korea Advanced Institute of Science and Technology (KAIST), and Pohang University of Science and Technology (POSTECH), agreed to collaborate to provide Massive Online Open Courses (MOOC) in the science and engineering fields. SNU President SUNG Nak-in, KAIST President KANG Sung-mo, POSTECH President KIM Doh-yeon, shared the belief that Korea’s current MOOC education in the STEM (science, technology, education, mathematics) was lacking and excluding. In order to enhance the STEM fields of the country, they believed that radical rebuilding of a MOOC model was required. Through complete cooperation of the universities, beginning from the planning of the curriculum, to the filming of the courses, the aim of the project is to complete producing the MOOC for distribution by the end of the summer of 2016. The STEM MOOC model comprises video lectures, freely accessible, anywhere and anytime, as long as students are connected online. The classes allow students to adjust the pace of learning, ensuring no one is left behind or bored. An aspect of the MOOC is the “flipped classroom.” This reverses the traditional educational system by providing instructional content online, outside of the classroom, and moves activities, traditionally considered homework, into the classroom. By doing so, the model is an embodiment of active learning, which allows for direct student engagement through reading, writing, discussion, and problem-solving under the supervision of an instructor. The STEM MOOC will consist of classes in the core sciences (physics, chemistry, biology), and the fundamentals of various engineering fields. By providing a core curriculum, the courses are not restricted to those in the STEM fields, but are also useful for those in the humanities, and even high school students looking for a taste of college education. By enabling accessibility, the model aims to increase the standard of STEM education and its popularity among the public. To ensure the highest standards of education, in the first year, prominent scholars will deliver the lectures of the MOOC: POSTECH President, KIM Doh-yeon, SNU Dean of the College of Natural Sciences KIM Seong-keun, SNU Dean of the College of Engineering LEE Kun-woo, KAIST Dean of the Department of Biology KIM Jung-hoe, KAIST Dean of the Office of Academic Affairs KIM Do-kyung, POSTECH Professor LEE Kun-hong, POSTECH Professor PARK Joon-won, along with other prominent professors.